If we superimposed this swing on the results of the May 2011 general election, the PAP would be hanging on to power by its toenails. It would find itself with only 46 seats in Parliament. Opposition parties would hold 41 seats. In addition to George Yeo, other current ministers who would then have lost their seats include Ng Eng Hen, Josephine Teo, Lim Swee Say, Lui Tuck Yew and K Shanmugam. Two new ministers appointed in 2011 — Heng Swee Keat and Tan Chuan-jin — would not have made it either. While the next general election is still quite far away, and much can happen between now and then, this should give us some inkling into Singapore’s future. In the by-election just concluded, Lee Li Lian of the Workers’ Party triumphed with 16,038 votes, representing 54.52% of valid votes cast. The PAP’s Koh Poh Koon trailed with 12,856 votes (43.71%). K Jeyaretnam, leader of the Reform Party, and Desmond Lim (Singapore Democratic Alliance) were crushed, with only 363 and 168 votes respectively. I daresay few people thought Lee Li Lian would win so convincingly. A hard fight was expected, and with it, a slim margin of victory for either the PAP or WP. If few among the commentariat expected this swing, all the more it must come as a shock to the PAP. Punggol East is a largely middle-class constituency, even if it is entirely HDB “public” housing, with youngish families. 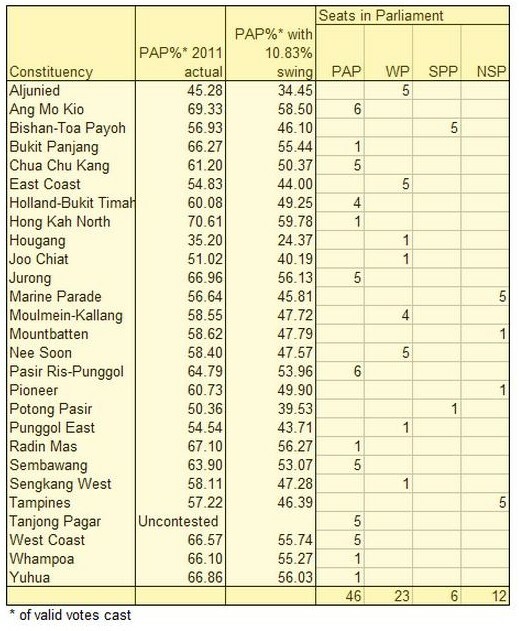 Political researchers have noted since the 2006 general election that the middle class was growing sceptical of the PAP; this by-election once again supports this finding. That gaffe confirmed to them that this guy was out of touch. That was the moment I told myself, this guy has a real chance of losing the election. Moreover, look at the way he carried himself in the interview, with an arrogant smirk on his face. He started the campaign with a fixed plastic smile — I noted it the first time he appeared in the media — probably stitched onto his face by his media handlers, but fixed superficial smiles soon give themselves away. Nor did the photo ops help. They — him riding the local light rail and unclogging drains — ended up making him looking more staged than real. However, I think the main reason the result went as badly against the PAP was a general unhappiness with the party and government. This is a continuation of the trend since 2006. There are specific issues, mostly of the bread and butter variety. These include increased job competition from immigration, transport crowding and rising prices. To these, the government had indicated post-GE2011 it was prepared to do some tweaking, but either people thought they hadn’t seen any meaningful results, or they wanted more than tweaking. The pity was that the election didn’t go far into these issues, so it is hard to fathom what people really want. However, these at least, are technocratic issues amenable to policy correction. Yet, it is hard to say that on these fronts things have gotten significantly worse since 2011, except maybe accelerating inflation. 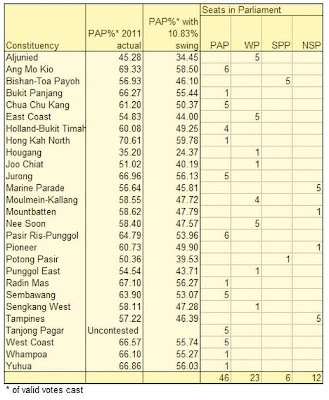 If the 54% who voted for the PAP in 2011 didn’t think things were bad enough then, why did 10-11% of them choose to change their votes this time? One suspects therefore that people have just grown more sick of the government, its style and its attitude. And this is something much harder for the PAP to change. The kinds of people it has recruited into its top ranks aren’t going to change their spots overnight, if ever. They may try a larger dose of public relations, but people will see through it as quickly as they saw through Koh Poh Koon’s plastic smile. The only way the party can cure this ill is if it has a thorough change of personnel at the top, but since this would be career suicide for those same heavyweights, well, it just ain’t going to happen. So, not only does the election result reflect a growing despair that the PAP would ever hear ordinary citizens, it also shows increasing public trust in the Workers’ Party, not least, in their ability to run town councils. It was a risk for the voters of Aljunied to vote them in in 2011; it will be less and less of a risk in other constituencies from now on. My table above notwithstanding, the growing strength of the Workers’ Party will put increasing pressure on other opposition parties. The latter will find it increasingly hard to win unless the WP passes up on contesting the same constituencies. Maybe not in 2016, but going by present trends, three-cornered fights will be quite common by 2021. These other parties will need to differentiate themselves policy-wise and do some serious groundwork in their chosen areas. On the other hand, as I had predicted in the wake of the 2011 general election, the Workers’ Party will be the target of increasing flak. Its electoral success means expectations will rise and its performance scrutinised. As Stella Ng said in the quote above, it is a “leap of faith”. The party has wind behind its back now, but political winds can be fickle.